For anyone who has ever tried to cast a large number (100+) of high quality bullets and keep them within a plus or minus one-half grain weight range, it soon becomes obvious that doing so on a regular basis can be a somewhat daunting task. Trying to control the myriad of factors that can affect the finished product has led many casters to believe that bullet casting is more art than science — more luck than skill. Let me say that I by no means have all of the answers to this sometimes baffling and frustrating element of the sport. There have been dozens of articles written by far more experienced and accomplished shooters than me that contain a wealth of information about casting bullets. The three Classic Compendiums offered by The Single Shot Exchange contain many wonderful articles that have appeared in print dating as far back as the late 1800s. Some of the best books that I have found about casting are two by Paul Matthews entitled “Cast Bullets for the Black Powder Cartridge Rifle” and “Casting Premium Bullets for the Black Powder Cartridge Rifle”. 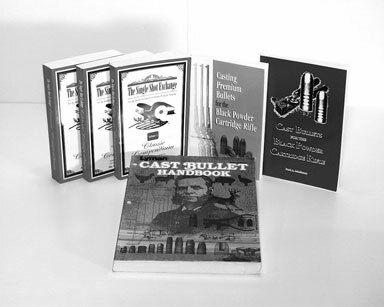 Lyman’s “Cast Bullet Handbook” is also an excellent source of information as well. These books cover virtually all aspects of the casting process including choosing alloys, fluxing, mould selection, mould maintenance, and much more. These publications contain a wealth of information, some of which dates back over 100 years, about how to cast quality bullets. What I would like to do in this article is give both novice and experienced casters alike a closer look at what I will hereafter refer to as the “Casting Cycle” and suggest some ways of making your casting more consistent. In Part II of this article, I’ll take a look at four common, but very useful items that you may already own to enhance your casting. Before we begin let me say that this article is not designed to cover every element of the bullet casting art. Let’s assume that you are already acquainted with the importance of using a clean, well-mixed and consistent alloy; the benefits of fluxing the melt on a regular basis; and that you have a pot of sufficient size to produce 50 to 75 bullets before needing to add more alloy to the melt. Let’s also assume that you have a source for reliable, accurate, and consistent heat whether it be an electric furnace, propane plumber’s furnace, turkey cooker burner, or an old camp stove. And finally, let’s assume that you already use a quality mould, such as a readily available commercial mould from Lyman, RCBS, NEI or others, or a custom mould made to your specifications. For those of you just starting to cast your own bullets, a word of advice: find a patient, kind-hearted veteran BPCRS shooter who is willing to help you get started. They can save you a lot of wasted time and money by avoiding the mistakes that they made when they first began casting. In fact, the development of the ideas and techniques presented in this article are based in part upon books and articles written by other shooters, and from conversations with experienced casters. 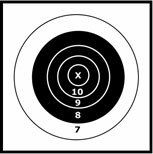 One article in particular, written by Lee Shaver and published in the April 1997 issue of Single Shot Exchange entitled “Casting Perfect Bullets”, was instrumental in changing the way I cast. After experimenting with a some of Lee’s ideas, I incorporated a few into my own casting process. 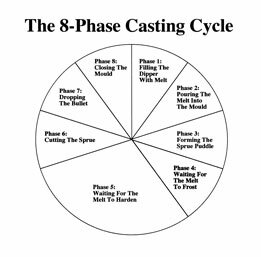 Performing the 8 phases of the Casting Cycle the same way with each bullet we cast is a key element in making premium bullets within a narrow weight range. In looking at how a high quality lead bullet is actually made, it became apparent to me that the process involved is very similar to that used in a manufacturing production line. Think of a factory with a conveyor belt moving a product from one workstation to next. At each stop along the way a worker installs a part or performs a specific task which brings the product closer to its completed form. This type of assembly process, with its various stages of completion, is very similar to what you and I do when we cast bullets. The major difference between the assembly line example I’ve just given and casting bullets is that casting is done by one person at one location and must be done within a given period of time each and every time in order to arrive at a high quality finished product.